This is a cautionary tale of how one horse had some very bad luck. Whiskey was born on my family’s Abbeyview farm in 2001. A typical bay thoroughbred foal, she was destined to race on the flat. 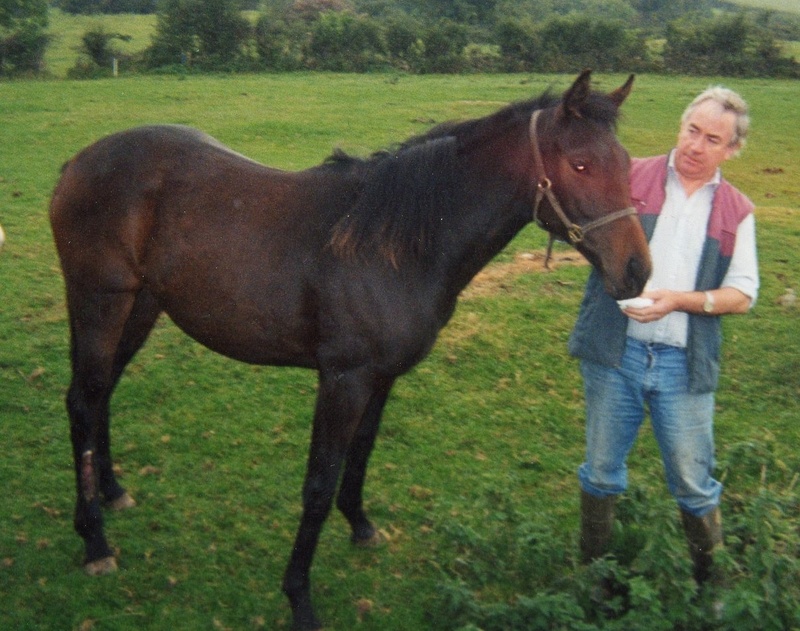 Whiskey’s first bout of bad luck came two days before she was due to travel down to Kildare to be prepared for the Goffs yearling sales. She ripped the skin from her off-hind cannon just above the fetlock and that was that. No Goffs for Whiskey. It soon healed and my parents decided to put her into training. Whiskey, sadly, was the laziest horse alive. The trainer told my parents she was so laid-back that there was little chance of her winning. Of course they had to give her a try. In six races, whilst never coming last, she was also nowhere near the front. So Whiskey came home to live out her days as a foalie-sitter. She was perfect for the job: cool, calm and collected – such a sweetie. Fast forward 7 years to the May bank holiday weekend. Bank holiday Mondays in the UK and Ireland give us a few three-day weekends each year. The family were going on an overnight trip to a cousin’s wedding. Whiskey, along with the two broodmares, was a couple of fields away from the house surrounded by lush spring grass. It was the broodmare’s ‘year off’ so they were all turned out to grass resting – they were in heaven. We checked them at 7am on the Saturday morning, all fine and dandy – water drinkers working and gates locked, perfect. We arrived home late on Sunday evening and in the dusky haze could see 3 horses in the field. Everyone was exhausted so we had some supper and went to bed. Huge mistake! Next morning mum got up and went down to the field to check the mares. She noticed from a few fields back that Whiskey wasn’t her usual self. Once she got to the field she knew something was up. She was standing still, sweat beating out of her. At some point Whiskey had developed colic – impaction colic to be specific caused by the change in diet. While we were away she had been thrashing herself off fences and gates. My mum called the vet on her mobile and took her back up to the yard. As she was so stiff and very reluctant to walk she had great difficulty, practically having to drag her up to the yard. She eventually got her into her stable, where the mare just stood there looking at us. It was horrific; she was so still. The vet came, took one look at her purple gums and said, “I’m really sorry there is nothing I can do, it’s too late”. At which point my mum turned and walked back up to the house. It was the first time she would have to watch a horse she helped deliver being put-down. Whiskey was then put to sleep. It all happened so fast – the rest of us were in a complete daze! A word of warning to all. Whiskey was a horse who never showed signs of colic before and never binged on her food. I had to ask my mum to recall this story so I could write this and she was distraught. Never take anything for granted. I’m glad I got to tell Whiskey’s story, she was a rubbish racehorse but a really loved member of the family and we will always remember her. Please, check your horses as regularly as possible. Most cases of colic, caught early enough, can be treated with a small number of them requiring surgery. Look out for the signs, not interested in food or water, getting up and down, continuous rolling, looking round at their belly, kicking their belly, unable to poo and pawing the ground. If you see a variety of these symptoms keep them moving and call your vet. Very good piece about colic, just lost two year old with travel sickness ( pneumonia) comes on very quickly then takes over 48 hours to be precise. Gutted after raising her,breaking her and sending her into training.